Japanese Episode DP 165: "Ohba of the Four Heavenly Kings and the Gym Leader Denji!" American Episode 1308: "Flint Sparks the Fire!" Satoshi and his friends have finally arrived in Nagisa City! Satoshi wastes no time finding the Gym but is quickly disappointed when he discovers that its Gym Leader is giving away badges without a battle! Satoshi doesn't want to receive his final badge this way, so he unsuccessfully tries to force his way into the Gym. 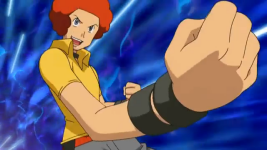 A member of the Four Heavenly Kings, Ohba, sees Satoshi's fiery passion and offers to lead him to the Gym Leader, Denji. He takes Satoshi to the Nagisa Tower, a building said to be the symbol of the city. There, Satoshi meets Denji, but he is still unsuccessful in getting him to have a battle with him. The owner of a nearby coffee shop suggests Ohba fight Satoshi in Denji's place. No one has any objections, so a battle is arranged. The first match is between Satoshi's Buoysel and Ohba's Goukazaru. Despite Buoysel's type advantage, Goukazaru is able to defeat its opponent with one attack. Ohba's pokemon is able to win its second match in a similar manner. Denji is losing interest in the match and is about to leave when Satoshi calls on his Pikachu to fight. The battle reminds the Gym Leader of his own Pikachu and how, like Satoshi's pokemon, it never backed down when things got tough. Satoshi's Pikachu eventually loses, but the battle has impressed Denji enough to change his mind about battling Satoshi for a Gym Badge. Elsewhere, the Rocket-Dan set their eyes on stealing the Nagisa Tower. To be continued! Hey, Satoshi and his friends have finally arrived in LaRousse Nagisa City! The show certainly took its time getting here, but now that it has, I think it's safe to say that it was worth the wait. It's depressingly rare to see a storyline from the games get adapted into the TV series so fully, so I was quite relieved to find that this particular one survived the transition. There were a few tweaks here and there, sure, but all the important stuff got left in. The battle between Satoshi and Ohba was pretty enjoyable, I thought. Sure, the TV series let Pikachu take more damage than it probably should in order to make a point, but the series does this sort of thing so often that it's hard to get mad at it for doing it yet again. I also really liked the way In Fight ("Close Combat" for all you dub fans) was animated, and the music that plays during the main part of the fight between Pikachu and Goukazaru ("Last Battle," Track 33 of the The Seven Nights' Star of Wishing, Jiraachi soundtrack) was really too perfect. One strange addition to the TV series version is that of the coffee shop master, an old man whose character design is so unique that you can figure out that he's going to be someone important the first time you see him. I can't really understand why the writers tried to pull off some kind of "plot twist" with him the poacher since it doesn't really seem to serve any purpose. How would the episode have been any different without this revelation? The way I see it, the only point of "Master" (as he's known in the Japanese version) is to give Denji someone to talk to while he's watching Ohba fight. Something else that struck me as odd was the fact that Hikari and Takeshi already seemed to know who Denji was when, only two episodes ago, they had no idea who the hell he was. Also, Takeshi, what is up with you suddenly having a set of morals when it comes to what Gym Leaders should and shouldn't do? It's not like you giving a Gym Badge to a kid who lost to you twice before leaving it to your absent-minded father is any better than Denji's refusal to battle. The English version of this episode introduced us to the dubbed voices for a couple of recurring characters, and I have to say that I'm pretty happy with the way things turned out. I was a little worried about Volkner at first because I thought that his voice would fall victim to the trap that so many other voices in this dub do (do one aspect of a character really well at the expense of every other aspect) but his VA really made the transition from apathetic Volkner to optimistic Volkner pretty well. Denji's Raichu and Pikachu keep their Japanese voices. Dawn: "Hey, that must be the Sunyshore Tower!" Brock: "The Sunyshore Gym is near there!" Originally, Hikari adds that the Nagisa Tower is the symbol of Nagisa City. The dub omits this for whatever reason. Later, we're introduced to Denji's nickname. In the Japanese version, Denji's childhood nickname was Nagisa no Ikazuchi (ナギサの雷), or "The Thunder of Nagisa." This is actually different from his nickname in the games, which is Kagayaki Shibiresaseru Sutaa (かがやき しびれさせる スター), or "Shining Shocking Star." The dub decides to go with his in-game nickname instead of his TV series nickname and calls him "Shining Shocking Star" instead. Volkner: "Oh, it's typical. I've seen it all before. I've fought countless weak challengers and they're all confident at first. Denji's last line here, in Japan, tells us that he fought so many weak challengers that he got sick of it (and therefore quit). It's an important piece of dialogue since it pretty much explains the entire episode, but the English version didn't think we needed it. Instead, dub viewers are given this generic line that doesn't really stand out, requiring them to use what happens in the games to fill in the gaps created by the dub's poor translations. Ash: "Alright, Volt Tackle, one more time!" Young Volkner: "Use Volt Tackle again!" Both Satoshi's line and young Denji's line are identical in the Japanese version (well, Satoshi adds a yoshi! before his command, but you get the idea) but are different in the dub. TPCI could have simply had Ash say Volkner's line - "use Volt Tackle again" and "Volt Tackle, one more time!" have the same number of syllables, after all - but they didn't for some reason. Weird. Brock: "It was a great battle." Dawn: "You battled a member of the Elite Four!" This would be an annoying dialogue change (originally, Hikari congratulates Satoshi for doing so well rather than state the obvious), but in this case, I can only laugh at how Dawn is only just now realizing that her friend fought a member of the Elite Four. I only wish we were privileged enough to witness the moment, hours from now, when Dawn sits up and exclaims that Ash just lost the battle. The looks on Ash's and Brock's faces would be priceless. After having his fighting spirit reignited, Denji refers to Satoshi as "Satoshi-kun" to show that he's warmed up to the kid. This isn't really translated for the dub. Finally, the dub decided to take us on a trip through memory lane by assaulting us with a barrage of awful electricity and fire-related puns. Narrator: "Ash's spark has ignited Gym Leader Volkner's spark, once again. Up next, Volkner vs. Ash, a guaranteed electrifying Gym Battle as the journey continues!" "Teh TPCI wirtors is s0 muCh woRsE then teh 4Kid$ wrIterz!!!1!1!11!!!!"